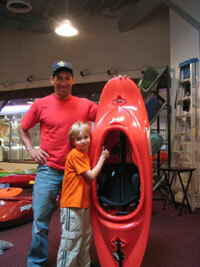 This guide is a partial list of companies that can provide proper gear for your young kayaker. It is now updated with new helmets and paddles. Kids fall into various sizes. 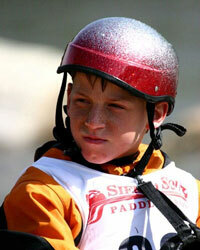 Once kids get up to 100 pounds there are plenty of options for dry tops, helmets, paddles, lifejackets, and clothes. For this reason, I will focus on less than 100 pounds and less than 5’ tall. Finding a boat that fits a little kid was impossible until the Fun 1 since there was none. The Jib, Dynamo, Blast, and Evo were all boats marketed as kids boats. Certainly kids can paddle them, but they all are outdated and geared more to the 90-130 pounders and all of them fit up to 5’ 8” people, not exactly designed for your 5-12 year old. Since I have a 10 year old that is 4’2” tall and 58 pounds, I designed this first boat, the Fun 1 for him. The reason to have kid in a little boat like the Fun 1 is simple. It is lightweight, easy to roll, easy to learn in, is super fun to paddle, and your kid will feel like a champ in a cool boat. 4 years old, 35 pounds- 150 cm wood paddle with small blades. 6 years old, 44 pounds- 150 cm wood paddle with small blades. 10 years old, 58 pounds- 175 cm Seven2 paddle with medium blades. I recommend the follow options. Hello Eric, My name is wayne schonell and I have started a new business www.woodycustompaddles.com, we met a few years back when I was instructing for summit kayak school, I have spent the last year developing my product and it is now ready for the general public, I would really like to make Dane a bent shaft paddle as being a custom paddle maker we intend to make paddles for any and everyones specific needs. Our paddles are made with a wood shaft laminated in a zero degree oriented knitted fiberglass, the blades are foam, laminated in kevlar and carbon fiber, using epoxy resins. I believe I am making the strongest paddle on the market and would of course reduce the strength factor for Dane and other kids to make the paddles weight comparable to their weight.I have made surfboards for over 25 years and use those skills in the making of our paddles, if this is something you would be interested in could you please send me the length of paddle, the width of his grip measuring between the outside of his big knuckles of his thumbs, also the diameter of his grip if possible. Our website is up and running and should be 100% ready to except orders by the end of this week for anyone else interested in our product. As a reference you could talk to Marty Cronin as he was able to see our product first hand at the cks paddlefest this past weekend here in colorado. Good luck with your new line, the boats look awesome and going by the interest shown this weekend you look to be having a great start to your new venture, congratulations, Wayne Schonell. 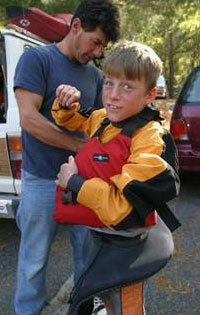 Lifejackets for kids come from Lotus Designs. A number of companies have made prototypes for my kids over the years but in the end, if you want to buy one, it is called the “Half-Pint” from Lotus. Go to www.lotusdesigns.com for information and a dealer near you. I am hoping that more companies will jump on board and make production lifejackets in the near future. The Half-Pint is a fully functional jacket based on the popular “Sherman” adult vest. It looks good, allows for full range of motion, and kids can get it on and off easily. Dane found that the Greatfull Heads “Edge” is a great size and easy to outfit for his small 10 year old head. Several kids from 4 and up have tried it on and it worked nicely. Dane also likes the look. We bought this helmet at Rock Creek on the Ocoee during the Spring Splash weekend since our new dog ate the straps off of his old helmet. Josh at 13 is also now working with Dane on a special helmet that will be designed for kids and designed with the help of Dane. I don’t know when it will be available, but keep your eyes out for that one too. For years Patagonia was the champion of the kids' gear arena. Dane has had his “size 8” neoprene shorts from them for the past four years and they are still fully functional. The Patagonia brand has merged with Lotus so you will now be buying Lotus Designs gear that was once Patagonia. The XS drytop is the smallest they make. When Dane wore his for the first time at Great Falls of the Potomac, he finished his paddling session, took off his drytop and found that his polypro was still dry. His exact quote was, “I am still dry! Thank you Lotus!” This is because the gaskets are small enough for him. The arms are still too long for a 5-8 year old, but functional. They claim to be designing a women’s line in which the XS will be even smaller than the current one. For Polypro there are many options from many sources, including Lotus. My new Lotus top is awesome. Its gaskets are nice and tight. The first day I used it I paddled for about 2 hours and I take my drytop off and from my waist to my wrist of my polypro was dry, Yeah! That’s never happened to me before. THANK YOU LOTUS!!! Mountain Surf provides a variety of fleece options including farmer johns, shorts, vests, and tops. They also have nice drytops but aren’t small enough for the 5-10 year olds. Wet Suits: Most of the wet suit companies make kids stuff. A farmer john, shorty farmer john, or wet suit shorts are perfect for keeping kids warm. Remember, a warm kid is a happy and safe kid. A little kid will get cold much faster than an adult. Dane is skin and bones, no fat to keep him warm, so he must dress warmer than me by a lot. I am putting him in a farmer john wetsuit this winter, along with a drytop. Stay tuned for more info. Please email any other information to us that we are missing. The goal is to make this section as complete as possible for parents and kids looking for gear. I will do what I can to get manufacturers of gear to be proactive in making kids stuff as well as making it more accessible. Author's profile: Eric Jackson is a World Champion kayaker and owner of Jackson Kayaks, makers of a full range of whitewater kayaks for adults and children. Check out his website at www.jacksonkayak.com.